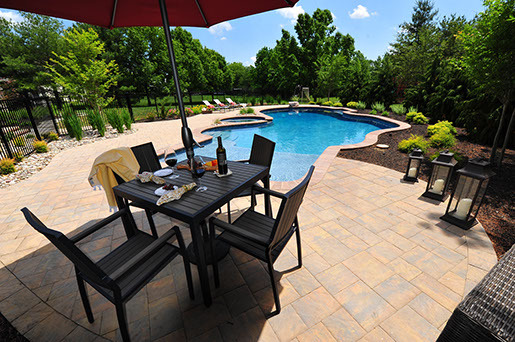 This West Windsor, NJ free form pool and covered patio make a beautiful outdoor living space. The space was designed for sun bathers and people who like to retreat to the shade as well. 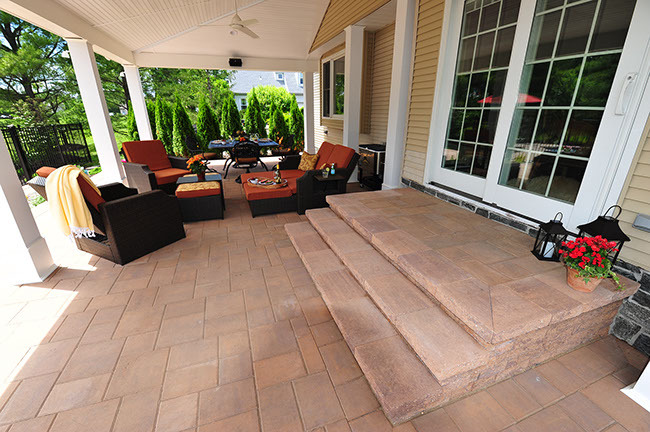 There is also lots of patio space to handle any social function where lots of guests will be showing up. Open spaces let the views come in of the beautiful surrounding green fields. 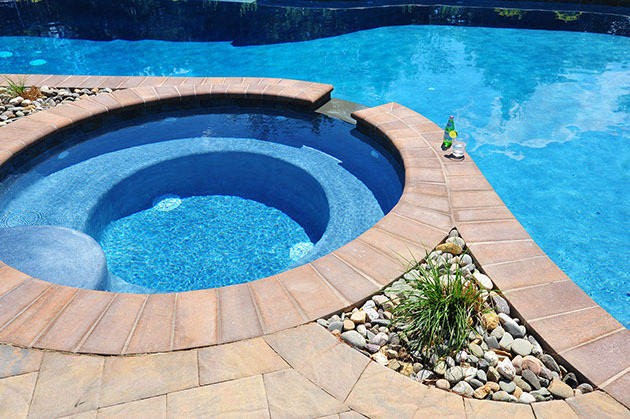 This pool features several water features. 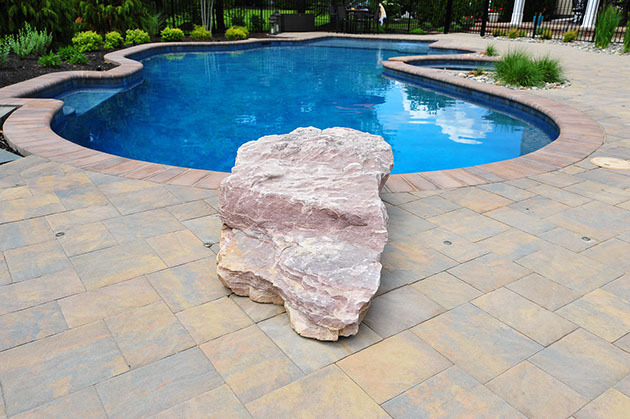 There is a diving rock made from a natural stone shaped closely to a diving board. There are two water jets. Built into the pool is a large sun-shelf and also a cozy corner or seat in the deep end. 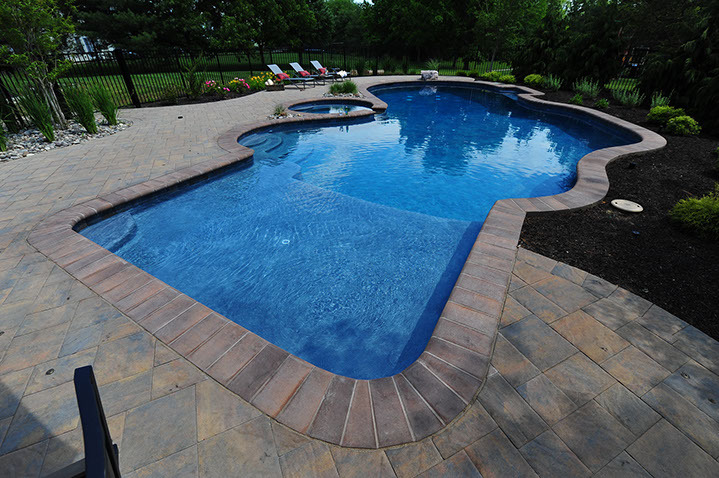 This spa is built at the pool deck height. 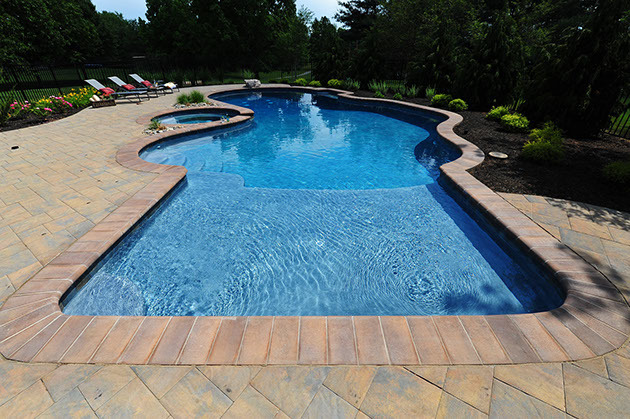 In the nooks and crannies surrounding the spa and pool are pockets of river stone and grasses to give a custom look, and help bring in some more natural surroundings to the spa area. 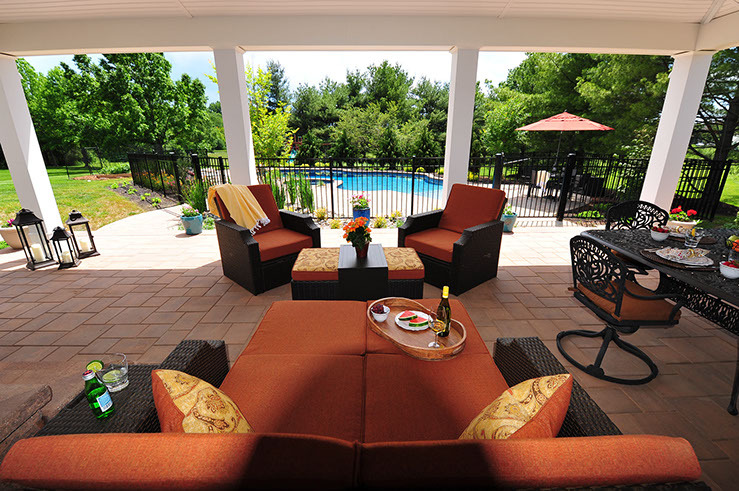 This beautiful covered porch makes the perfect outdoor living area. The roof has tongue and groove boards and fans built in for cooling off. There are outdoor speakers up there as well. 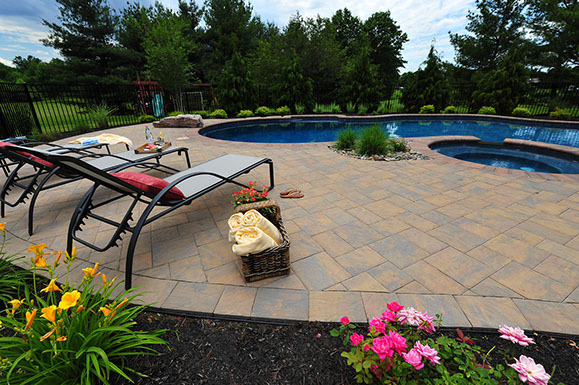 EP Henry Bristol I smooth pavers make the patio. 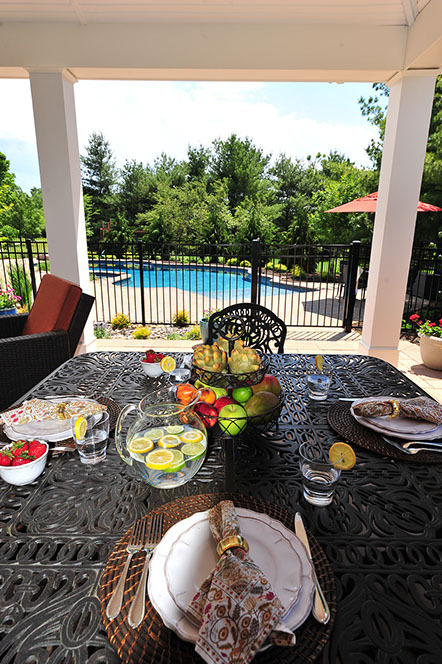 This is a great area to entertain guests or just relax outside in the shade. This stepping stone path was constructed with irregular bluestones and it goes from the pool all the way up the side of the house to the front yard. 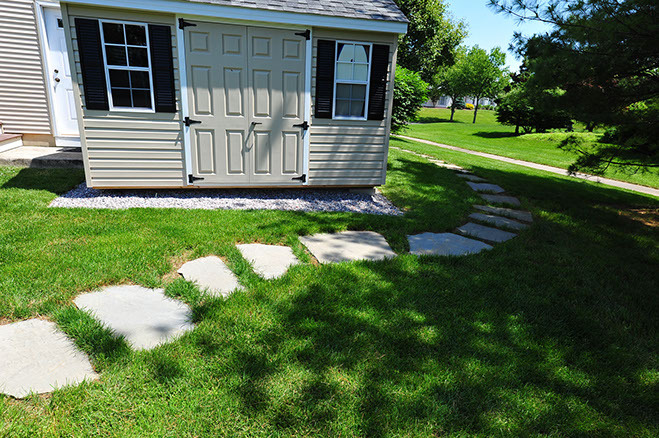 The shed was also installed to house various yard, and pool equipment.